Description: I really love cheat sheets. In a lot of cases they can take the place of an entire manual. So I was surprised, given its popularity that I couldn't find a single-page reference for the arduino online. I've managed to cram in every function and bit of syntax for the entire extended reference page on one A4 sheet! As well as some chip specs and other info. Read more | Permalink | Comments | Read more articles in Arduino | Digg this! WriteMonkey is a full-screen, portable plain text editor with: customizable colors, fonts, and sounds, statistics, bookmarks, text replacement shortcuts, autosave, history, Markdown/Textile shortcuts and export, and much more. Requires .NET Framework. Google, Broadcom close to enabling 802.11n on Nexus One? How much Trash is in the Bin? With this, you don't have to worry! Ronan’s Autotrash review intrigued me to find a similar application or script for the Windows operating system. Autotrash is a Linux script that allows a user to define recycle bin deletion rules. Example usage would be to configure it to delete data only older than seven days, or to automatically empty the trash if the disk space on the drive drops below 10 Gigabytes. I was not able to find a Windows equivalent for Autotrash despite my research efforts. Though there appear to be no direct analogues, one application that does feature functionality similar to Autotrash is Bin Manager. The program has been designed for Windows XP but is compatible with 32-bit editions of Windows Vista and Windows 7 as well. However, 64-bit Windows users will not be able to use the program. 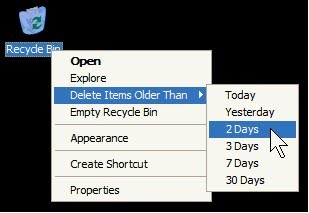 Bin Manager adds a new context menu entry to the Windows Recycle Bin. The entry Delete Items Older Than leads to a submenu that can be used to delete files in the recycle bin older than the specified age. Available for deletion are Today, Yesterday as well as 2, 3, 7 and 30 days. Intuitively, Bin Manager will delete all files in the recycle bin older than the specified age. The software program aids users who prefer to keep data in the recycle bin for some time to be able to quickly purge deleted items older than their preferred safety net. To do so, all they need to do is to regularly actuate Bin Manager to delete the files that are older than the specified age. The manual approach has a few disadvantages. One obvious disadvantage is that the user can neglect to regularly perform the operation. Thankfully, the Bin Manager developer provides a basic script that can be integrated into the shutdown or startup commands in the Group Policy. Bin Manager is a helpful program, especially for users who keep data in the recycle bin for some time before deleting it. The software can be downloaded directly from the developer’s website.